Woodblock printing has a venerable history in Japan, where the medium has been in widespread use since the early seventeenth century. 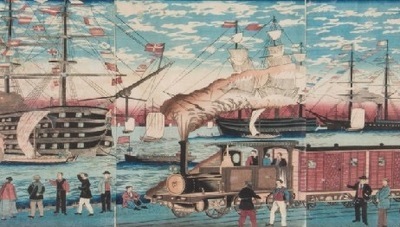 While the medium of this print is very traditional, the subject was remarkably modern—the first rail line in Japan, which ran from Yokohama to Tokyo, was still being finished when this print was completed. The European and American ships in the harbor were also a new sight in Japan, which had only been open to Western trade since the mid-1850s.